you'll wish you had more time! 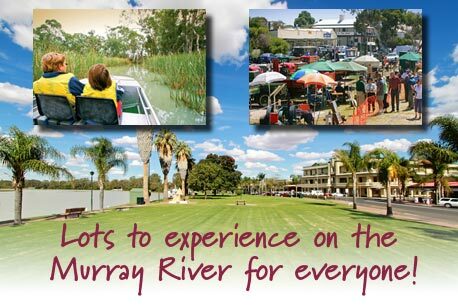 The Murray River is world famous for it's diverse experiences, food, wine, houseboats, cruises, paddleboats, golfing, family fun, history, camping and much more. In fact, there's so much to do and see we can't list them all here. Enjoy a taste of our great Murray River through Victoria, New South Wales and South Australia. 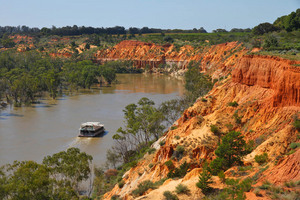 Begin your Murray River road trip on the Discover Murray River Trail. 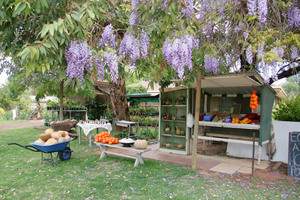 The river is a great destination however, if you stay longer in each town contact the local visitor information centre. The Murray River region is one of Australia's oldest living cultural landscapes. 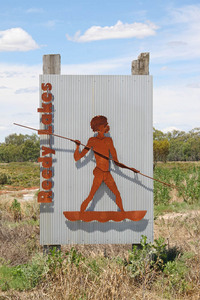 Thousands of years before European settlement, the Murray River brought abundance to the many tribes along its banks where the traditions were passed on generation after generation. You can enjoy learning and understanding one of the world's oldest cultures. The Murray River has some wonderful local drives in each region. Although our list isn't exhaustive, it does allow you a taste of beautiful river scenery, farmlands, river communities and much more through Victoria, New South Wales and South Australia. The Murray River has some of the best kayaking and canoeing experiences in the world. We're not talking about rapids, instead imagine the peace and serenity as you silently glide and discover the backwaters, creeks and lagoons on one of the many dedicated kayak and canoe trails along the Murray River. There is so much of the river to explore with its bio-diversity and abundant riverbanks that sustain so much life. Another great thing about the Murray and Mallee is how kid friendly we all are. We love kids to come and play in our region and you'll find a host of things that will keep children entertained while they learn about our great river region. You can also find some great budget things to do yet still have yourself a good family holiday. This includes history walks, playgrounds, fishing (permit for NSW/VIC), camping, interactive centres and more. The Murray river plays host to many species of fish and apart from the regulars such as Murray Cod, Callop, Catfish, Bream, Macquarie, Perch and Redfin, there are a large number of assorted fish which are largely unknown. For instance there are Gudgeon, Tupong, Freshwater Sunfish, Pigmy Perch, Line-eye Gudgeon, Tcheri or Hairback Herring, Silver Perch, Blackfish, Trout, (both Brown and Rainbow) Carp, Tench and many types of native Trout. One of the challenges for native fish are the European Carp. If you catch a Carp you cannot return it to the river and will be fined if caught. They are a pest which destroys river quality and fish habitats. Discover Murray offers you some amazing and interesting stories of the Murray River and Mallee regions that have shaped Australia's culture, tradition and heritage. When you explore the stories of our region you'll begin to see the rich experiences to connect with. The Murray River is a fine thread that runs through Austalian communities and within each community are their own unique stories you can appreciate and learn to enjoy and experience. The national, state and conservation parks of the Murray-Darling Basin are exceptionally diverse from lush Snowy mountains tops to the big red sunsets and diversity in the Mallee and the ruggedness of the Coorong. 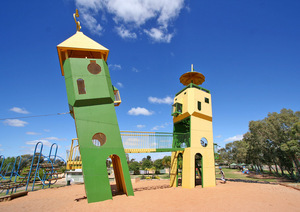 Victoria has a series of River Red Gum Parks including Murray River Park, Murray Sunset National Park and Hattah-Kulkyne. Some of our parks are Ramsar listed and as part of Biospheres. Enjoy the beauty that a water landscape brings to life along an ancient river system. 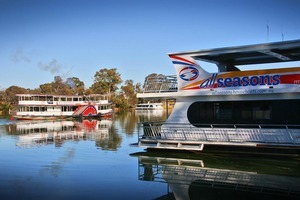 Cruising the Murray River is one of the most amazing and surprising experiences you'll have. 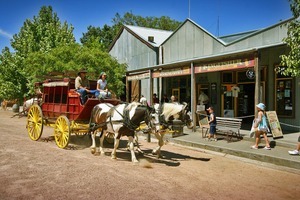 The Murray is much more than a river, it is quintessentially Australian experience. Within a relatively short distance from Adelaide and Melbourne you can experience jaw-dropping beauty, diverse history and luxury all surrounded by a sense of peace that has to be experienced to understand. When you're looking for that special weekend away or a long term holiday we can assure you that there's some pretty special experiences along the Murray River. The Murray River region is close to capital cities but offers something difference in the romance department...a tranquil river and magical, ancient location. Unique luxury accommodation options, some of the best food and wine experiences set amongts great landscapes ensures you and your love will find time, space and the perfect environment to reconnect. Explore the beautiful vineyards and taste world class wine from the Murray River region. The Murray River has some of Australia's best known wine regions. Through Victoria, New South Wales and South Australia you can experience a treasure trove of tastes, styles, flavours, landscapes and cultures. 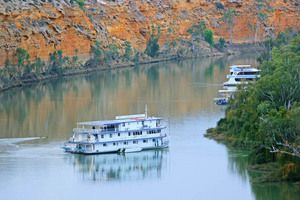 Cruising up and down Australia's greatest river on your own fully self contained houseboat holiday is a great way really disconnect from the hustle and bustle of life. There's an abundance of wildlife, character rich towns, stunning riverscapes, and hundreds of kilometres of stunning landscapes waiting for you and your family and friends. Just magic! As you can imagine, a river system 2,520 km long has lots of things to see and do. Visit the local towns page where you'll find events, attractions and much more and contact the local visitor centre through the Murray River website where their helpful staff can assist you with all the great experiences in their region.